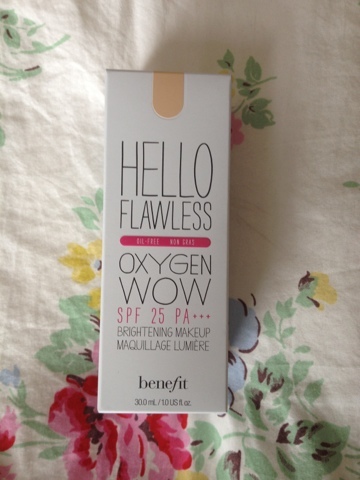 So I finally managed to get my little paws on the Benefit Hello Flawless Oxygen Wow foundation this weekend, I had tried it out at the Benefit stand in my local Boots the week before and fell in love with it, as you can probably guess, I'm a huge Benefit Makeup fan, I love everything from the packaging to the names of the products and just to the pure girlyness of all the products but have always wanted them to bring out a liquid foundation. 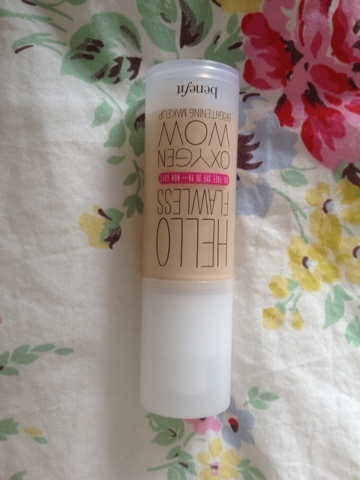 So, the Hello Flawless Oxygen Wow foundation (bit of a mouthful!) is fab, it gives a little more coverage than my usual foundation (Bourjois Healthy Mix Foundation - click for review) but I could have just been a bit heavy handed applying it in my excitement, I used a full pump of liquid but half a pump could work better for the day for me! 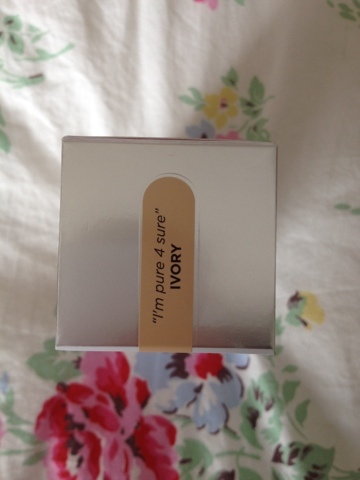 I went for the foundation in "Ivory - I'm Pure for sure" which I think is the second lightest, at first I thought it could be a bit pale for me, but it blended perfectly and comes out a little darker on the skin when blended in. The foundation itself leaves skin with a lovely dewy, healthy glow finish which is exactly what I love in a foundation and covers up any imperfections perfectly! I applied this over Benefit's That Gal which is a primer that brightens up the face, I will be doing a review on this separately and they really work well together, lightening and brightening the face. The bottle is a see through pump bottle, nothing too special there but I'd prefer to not have any gimmicks when it comes to design really, but one of the pretty cool things about this foundation that the lovely Benefit lady told me about is that the pump doesn't actually have a tube leading into the liquid, it's an air pump that circulates the liquid to get it out, during tests apparently they found that the tubes in foundation pumps can build up bacteria which can cause skin breakouts if a foundation is old, so while I can't comment on this yet, it's good that they have thought about things like this rather than just pushing any old thing out! Another thing that I love about this foundation is that it is SPF 25 as well as having a 3 star PA (UVA) rating which I believe is the highest you can get. This foundation is oil free also but surprisingly moisturising so would suit most skin types I think, I struggle sometimes with foundations soaking into dry patches throughout the day but after a few days wear with this, can honestly say have seen nothing of the sort! Definitely fallen a little in love with this, you can get it from Boots or most department stores for £24.50, mine also came with a little sample of Porefessional as well and a little tub of the Benefit Moisturiser! 3 comments on "Benefit Hello Flawless Oxygen Wow Foundation"
Great review! That is so interesting about the air pump- I had no idea, but it makes sense! I absolutely love Benefit Cosmetics as well, so I have been curious about their new foundation. The only thing making me a bit hesitant is that I have combo/oily skin & I'm not sure how well this foundation would hold up..